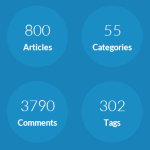 Just like last time, with blog post #100, I would like to share some of this blog's statistics with you. Feel free to skip this post if statistics don't interest you! I just know that some (other) readers like to see this kind of stuff. I promise not to bother you with this again (until blog post #300 of course). I configured Google Analytics on July 10th, and it tells me that the site had 51,460 unique visitors since that date (with 79,428 separate visits and 121,205 page views). The peaks in the graph were caused by large numbers of visitors checking out the various top 100 lists on this site. In the month of December the blog had 16,800 unique visitors, 23,600 separate visits, and (on average) 1,135 page views per day. The Technorati authority of this blog stands at 127. The Alexa rank is of this blog is 253,976. Oh, and by the way… What I find very interesting is that the numbers 1 through 36 on the Top 100 list all seem to be bloggers from the US, with a few exceptions (UK and Australia). This means that NOOP.NL is now the #1 (Continental) European blog for managing software developers. That's nice, isn't it? Well, that's as far as my bragging goes for today. What it all boils down to is that I'm very glad that people like what I write. These statistics are a tremendous boost for my morale, and I will work really really hard to make the results even better when I show you the new figures in blog post 300. In the mean time, keep reading! Do you have your feedburner stats integrated with Google Analytics? If so, how did you do that? @Jason: Actually no. I did migrate the feed from FeedBurner to Google, but it isn’t integrated into Google Analytics as far as I know. Thanks! I didn’t know you could do that!